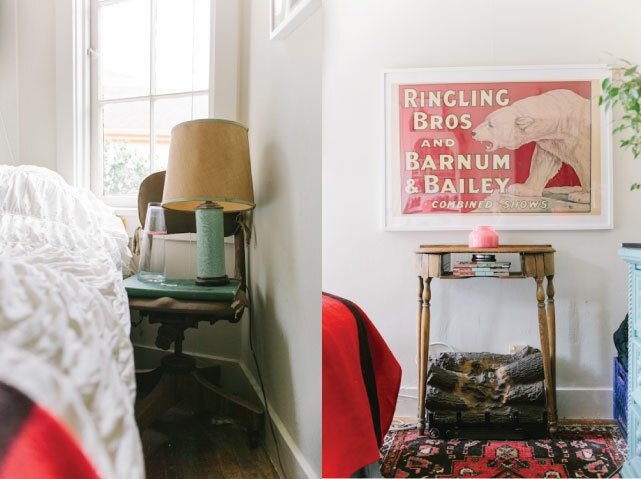 Last night while I was looking through the sneak peek archives over at design sponge, I found this bright and cheery little cottage that belongs to Rebekah Carey Mcnall, of A & B Creative. It's suppose to reach 60 this weekend and I can just feel spring on the horizon. This little place feels like it pulsates with a spring vibe of walking around the neighborhood stealing peeks into open doors and hitting up estate sales. 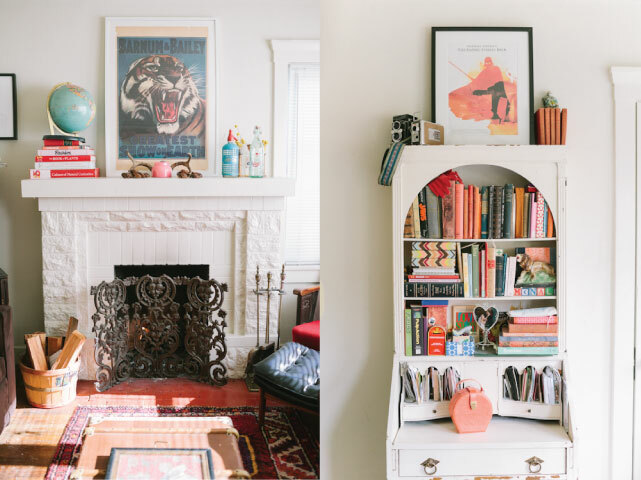 I immediately spied that vintage fireplace insert in the last photo. I have one too - I get made fun of a lot for loving it as much as I do, though mine happens to be in storage at the moment. But I love that she found a place for hers right under a bedside table. Clever. I am fairly certain I couldn't pull of this look quite so well but I would definitely have fun visiting and looking at all her vintage treasures (and i wouldn't mind owning a few of them either!). And, in case any of you are wondering, yes, I finally pulled the trigger and bought my new camera yesterday. Hopefully it will get her soon and I can show it off next week. Hope you all have a great weekend and get some good weather too. I am crossing my fingers that we will indeed get that 60 degree day they keep talking about. This is just gorgeous. I love it all. 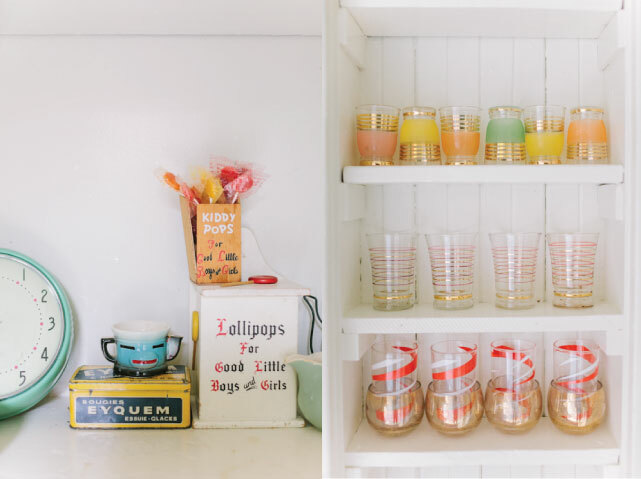 Especially the vintage glasses and the lollipop tin, I'd love something like that in my kitchen. Oh, I really enjoy this. My taste is a bit more minimal I think (Let me amend that. My taste is more minimal, my house is not. You have kids, you know.). But it's so cheerful and filled with things that are clearly well loved. Wait. She stops and rifles through her inbox. No email. Which camera did you order????? 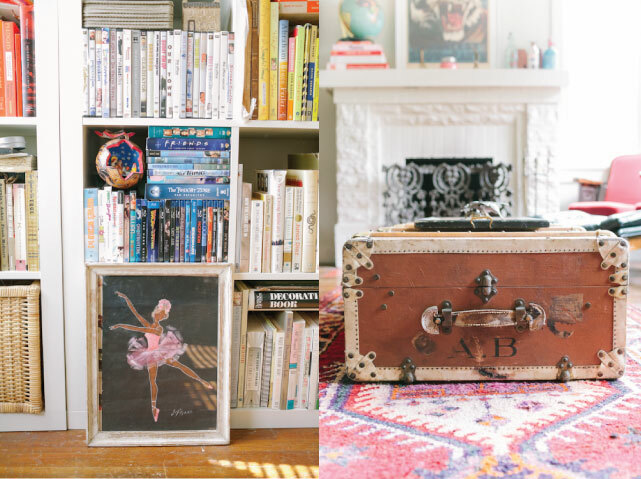 I like the idea of a vintage trunk for a coffee table. Congrats on your new camera! Have a wonderful weekend! Sweet little home. 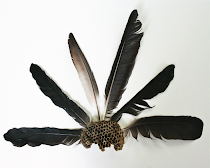 I'm having fun taking a closer look at all her vintage treasures. As you can see, we're all giddy over your camera purchase. (Good for you, Christine!) Can't wait for you to share which one you purchased. The temps are suppose to "warm up" (< that must make most people laugh since Southern California doesn't really get cold) around here, as well. Have a beautiful weekend! First off, I love that you are already conjuring up thoughts of Spring: that's what we need right now! I really like that glassware collection with the gold details. AND good on you for making the jump on the camera!! I love how airy this place looks, and the seemingly endless books. What type of camera did you buy? 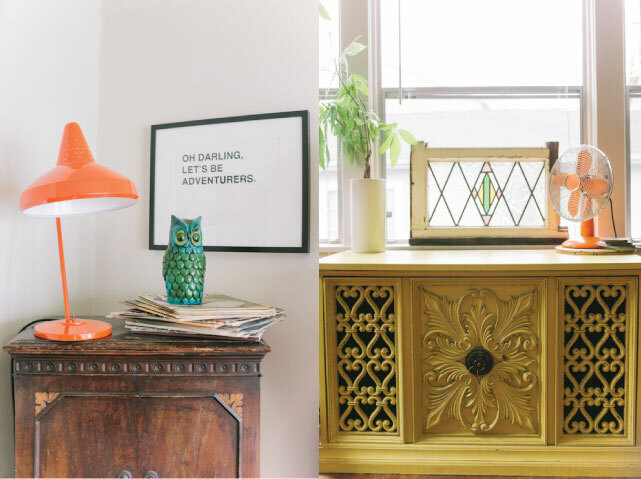 I love homes that are a little like treasure-chests, there seems to be something new and awe-inspiring to explore in every corner. I think they usually feel quite cozy and homely too. So many treasures in that house - it looks like so much of it was collected from travels! Great home full of personality! I love the 'let's be adventurer's' print - do you know where you can get it from? Love the selection of colourful glasses too. Have a lovely weekend. Magnifique interior! I love this vintage style!! Gorgeous, gorgeous, gorgeous! Thank you for the introduction! I could stare at this place all day! It's so welcoming and charming and I have serious fireplace envy! Hope you had a wonderful weekend, can't wait to see the shots from your new camera!